Under the Directive, all EU countries are required to use energy more efficiently at all stages of the energy chain, from production to final consumption. 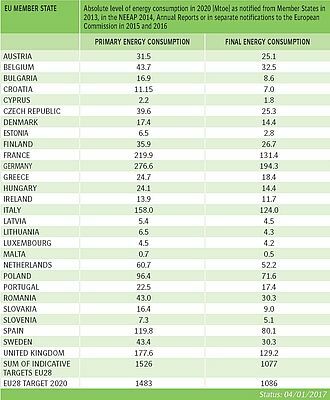 To reach the EU's 20% energy efficiency target by 2020, individual EU countries have set their own indicative national energy efficiency targets. Depending on country preferences, these targets can be based on primary or final energy consumption, primary or final energy savings, or energy intensity.